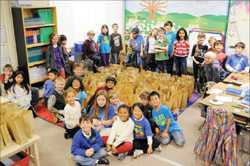 When it came time to organize the annual winter holiday party in her daughter’s first ­grade class at Bullis Charter School, Christina Mireles wanted to help the students celebrate the holidays in a way that didn’t involve making styrofoam snowmen. Searching on the United Way website for a meaningful way for children to give back to the community, she discovered EHC LifeBuilders in Sunnyvale. Working with classroom teacher Nancy Barlow during the weekly “Writer’s Workshop,” Mireles described to the 20 first­graders how at the EHC LifeBuilders shelter, clients in need arrive in the late afternoon, sleep for the night and then eat breakfast in the morning. The shelter then provides everyone a small snack for the day when they leave at 6 a.m.
After consulting with Elizabeth Griswold, community relations specialist at EHC LifeBuilders, Mireles suggested to the students that they provide a midday snack for 125 adults for one day. The class discussed how serving others relates to the school’s integrated character pillars – Citizenship, Fairness and Respect. The children brainstormed ideas for stores from which they could ask for donations and composed request letters. Their letters generated more than $170 in gift­card donations from Safeway, Trader Joe’s, Draeger’s Market and Target, as well as perishable donations from De Martini Orchards, Andronico’s and Starbucks. Anagha Jain, mother of a third­grader at BCS, recruited her daughter’s class to participate in the project by creating 125 handmade cards with holiday wishes and words of encouragement. During their holiday party time, the classes collaborated to decorate and fill 125 bags with snacks, which were delivered to EHC LifeBuilders. An abundance of donations enabled the students to contribute additional items to the shelter, including 12 pounds of brown sugar, raisins and men’s socks.